Not much to say either bad or good about this collection. The basic premise is interesting enough: How will humans communicate with aliens. 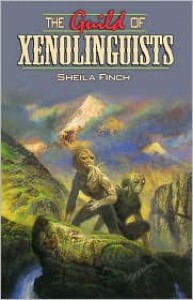 In Finch's future history, the Guild of Xenolinguists arises to meet that need. Unfortunately, Finch doesn't do a lot with the idea, preferring to remain within comfortable boundaries. For instance, she posits that Chomsky's theory of a Universal Grammar and the Sapir-Whorf hypothesis are true not just for humans but for all races, and then she posits that "Mother Nature" was so happy with the humanoid form, it became the norm for most intelligent species. So we're confronted with a collection of stories that, despite what Ian Watson's forward and Finch's afterward claim, don't really go much beyond the usual Star Trek episode where everyone speaks English (or Klingon, now that they have their own dictionary). That said, there's nothing "wrong" with any of the stories (unlike one reviewer, I was never minded to throw the volume against a wall). They're competently written and reasonably imaginative. I am reminded, as another reviewer remarked, of Asimov, and more broadly the other Golden Age writers - interesting ideas otherwise hampered by pedestrian imaginations and writing skills. If I were to recommend a recent book about communication with alien minds, I'd go with Peter Watts' Blindsight.